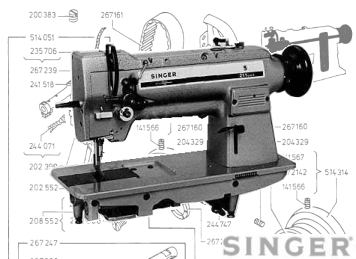 SINGER 211W 211G & 211U, Single Needle Walking Foot Lockstitch with Needle Feed. Many variants were built in the UK, Germany and the United States. Very popular with Upholsterers and Leather Goods Manufacturers. This is just a selection of the parts we have available for this machine, so if you cannot see exactly what you require, take a look in the PARTS BOOK below or please call, we will be delighted to help out. Over 400,000 Parts & Needles ready for Immediate Despatch. Call today, get them tomorrow.